The USMMA lost 2 great mares this year: Summerwind's Chanel de Miami 1996-2011 and 4 Seasons' Tapixaba do Vale Vermelho 1998-2011.. They left us before their time and the only saving consolation is the foals they left behind them. Chanel had 5 foals: Artemis and Enya will stay with Summerwind. 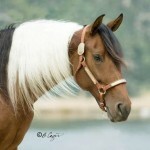 The others are Destiny do Summerwind in TX and Caesar do Summerwind in CA. Her first foal Coco de Miami is deceased, born in FL. Tapixaba had 4 foals, all pintos! 2 foals Tapi's-Pinga and Ze Travao are with 4 Seasons. The others are Casablanca do Premier in OR and 4 Seasons Edipo is deceased. 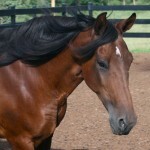 ← Discover Horses now lists the Marchador breed!